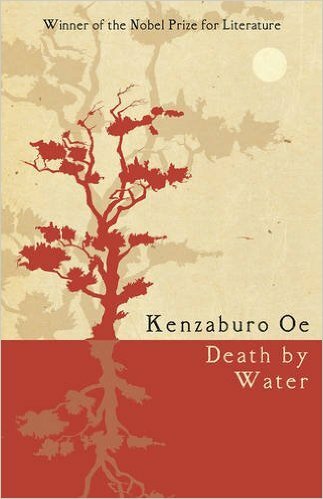 Nobel Laureate Kenzaburo Oe brings the novelist career of his literary alter-ego, Kogito Choko, to a close with the publication of his new novel, the most recent in the series, Death by Water. This installment explores the intensity of interconnectedness between parents and their children, particularly, but not exclusively, between fathers and sons. Its themes of regret and loss saturate the book with a heavy sense of sadness it’s difficult to shake, flirting with the point of wallowing. Oe doesn’t shy away from the bald illustration the sins of the fathers are often visited upon the sons, the mistakes of one generation teaching subsequent generations little about averting the same disastrous behavior. Choko is a writer haunted for a lifetime by the sudden and violent death of his father, when Choko was a child, a death obscured by secrecy and silence. As a result of his loss, grief and guilt infuse all his relationships, threaten to destroy his mental state, and stunt his career. The specter of his father’s last moments torture him, to the extent happiness in any other aspect of his life is severely compromised. Oe has created a man damned by his own regret, a character nearly impossible to sympathize with due to his single-minded intention to see all his life through a prism of self-imposed, exaggerated mourning. The adults in the protagonist’s life made matters far worse for Choko by remaining closed-mouthed, shrouding the already traumatic event in forbidden mystery, leaving him to think the worst. Reeling, all he knows for certain is documents locked inside a red leather trunk, an object he will spend the greater part of his life coveting, can explain all. Little else is said, next to no effort made to comfort the child, to help him move beyond his sadness. Small wonder he found himself stymied. A later rift with his mother denies Choko hope of exploring the secrets contained in the trunk, his one link to revealing the past. Having published a novel speculating on one possibility explaining his father’s death, his mother becomes so irate at what she sees as a weak and pathetic characterization of her husband she cuts off her only son, disowning him. It’s only later, when Choko’s son is born with a defect in his skull—mirroring a situation in Oe’s own life, leading him to create Choko’s story—that she relents. Even then, by the time he’s allowed possession, ten years later, he finds his mother has decimated the contents, burning the most damning documents. What she did leave, however, was an audiocassette containing an explanation of the truth. Ironically, this truth leaves Choko with little useful information for use as the framework of his final novel. It had been his dream to end his career by writing his father’s story, through the lens of T. S. Eliot’s poem “Death by Water,” from which poem Oe takes the title of this book. In one final punch to the stomach, Choko sees his dream slip away. For better or worse, his mother has won. Fortunately for the novelist, a company of actors known as the Caveman Group has dedicated itself to the revival of his by now languishing canon. Through the determination of a young actress and budding director, Unaiko, as well as the theatre’s manager, Masao, his deflated dream will be revived, the story’s focus changed from his father’s death to the imaginary friend he created as a child, named Kogii, a name his family had chosen as a fond diminutive of his own. This creature of his imagination, always a larger than life figure to him, takes center stage in the dramatization of his works. For the first time in his 70 years of life, focus is shifted from his loss to a much more positive childhood experience. In an unexpected reversal, the curse of disappointment suffered from the empty trunk becomes a blessing. For all Choko’s newfound renewal, he fails to notice how his great hypocrisy toward his own son is perhaps an even more grievous and abhorrent transgression than any perpetrated on him. His justification for his behavior, that his son is a great disappointment, reflects frustration in the face of his failed quest. Despite the lift he feels from his exciting new project, he remains unable to change the landscape of his life, neglecting to turn lessons learned from traumatic childhood experiences into the chance for happiness with his own family. Once again Choko has suffered a loss, this time one he can’t seem to recognize, in the way of estrangement from his son. Nearing the end of his life, he has become a very selfish, hardened man toward all but the members of the theater company who stroke his ego. But, in yet another twist, life swiftly delivers a strong reprisal, a consequence so severe it can’t help but change him. At last, things have come full circle. Death by Water is ostensibly the prolonged keening of a son for his lost father, running parallel with the story of a mother’s grief for the son whose fixation with her husband’s death threatens to destroy his relationship with his own son. While it does have the redeeming grace of interesting sub-plots, the whole of it is fixated on often-repetitive expressions of misery. This, as well as the often simplistic, occasionally pedestrian prose is a large flaw. Whether the prose failings are a result of translation is difficult to say. In any event, the novel could have stood deeper editing. Not having read the previous novels in the series may be a hindrance; I can only speculate on that. Still, knowing more of the backstory of Kogito Choko would do nothing to rectify the shortfalls in the prose. Overall, the story is a moving one. Regret and loss are powerful forces in a life, the loss of large parts of childhood a travesty. Oe does a masterful job expressing these themes through his characters. Unfortunately, the novel is alternately so stylistically over-wrought and stilted as to jerk the reader out of the tale, inhibiting its flow and power. Pruned to a leaner work, Death by Water may have been a thoroughly impressive book. As it is, the story is weakened, its truths strained. If this is the last we see of main character Kogito Choko, it seems a sad farewell. After seven novels, the reader can’t help believing this semi-autobiographical character deserved so much more.